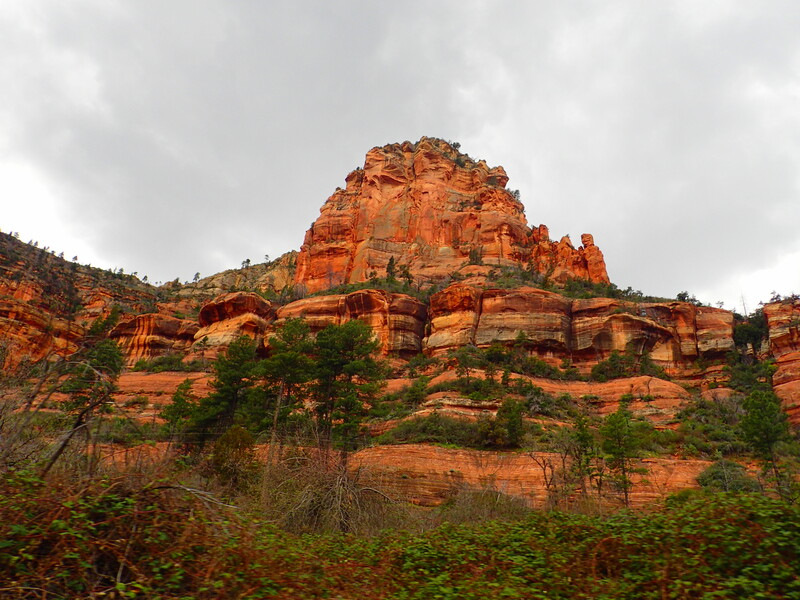 Sedona is a pilgrims’ town with a heavy emphasis on eco and “spiritual” tourism, so you have a wide mix of people coming in from out of town: rock climbers, off-road drivers, wealthy shoppers, those seeking some sort of supernatural phenomenon from the vortexes, it has it all. As such the campgrounds were almost all full, and the first come, first serve campground I was trying to get to may not even exist, at least not where I thought it would be. We had survived the steep twisting downhill run on 89A and had continued a touch south of downtown looking for Chavez Crossing campground. (We have since learned it was in a different place and only for group camping reservations, not individual rigs.) As we hesitated before heading down an unimproved road, we decided to ask directions from a woman parked there about a campground up ahead. Now, imagine your town. What are the odds of just asking a randomly selected resident about a campground nearby, and not only do they know the answer to that basic question, but can also advise you on multiple alternative free camping sites suitable to your vehicle size? That just doesn’t happen, except it did. This Sedonan woman is probably an outdoor and hiking enthusiast as we spotted back packs in her trunk while we were speaking. She advised against proceeding down the road ahead as there was no campground that way, and sent us south of town on the lookout for a small, barely marked road, which turned out to be Forest Road 525. We turned off the highway onto this dirt and gravel washboard road, and almost immediately spotted a couple of camper vans and an airstream trailer at a circular pull off. One of the guys camping there told us there were a dozen more spots capable of holding several rigs each down the road. We continued and selected a nice, relatively level, and unoccupied spot on a hill. It even had a fire ring already prepped. Overnighting: staying in a parking lot, e.g. Walmart, for a night, no hook ups. Usually free. Dry camping: staying in a campground without hook ups. May include small campground fee. 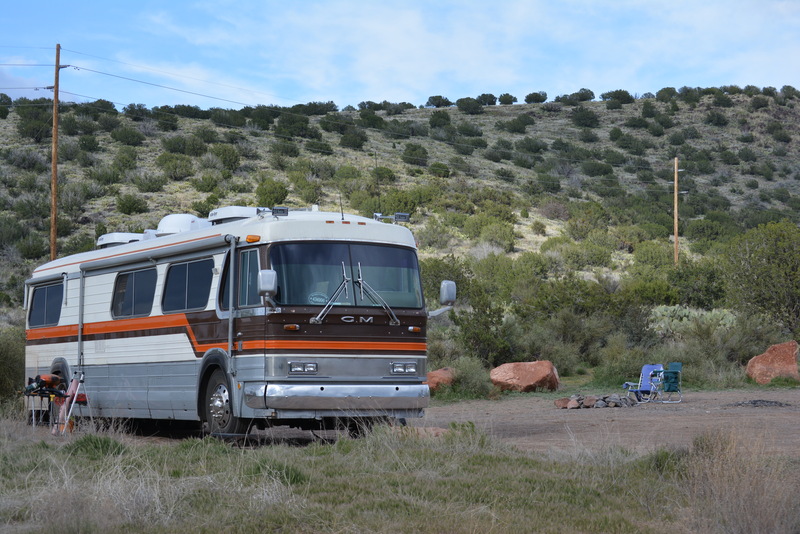 Boondocking: staying in wilderness area, not a campground, with no hook ups. Usually free. 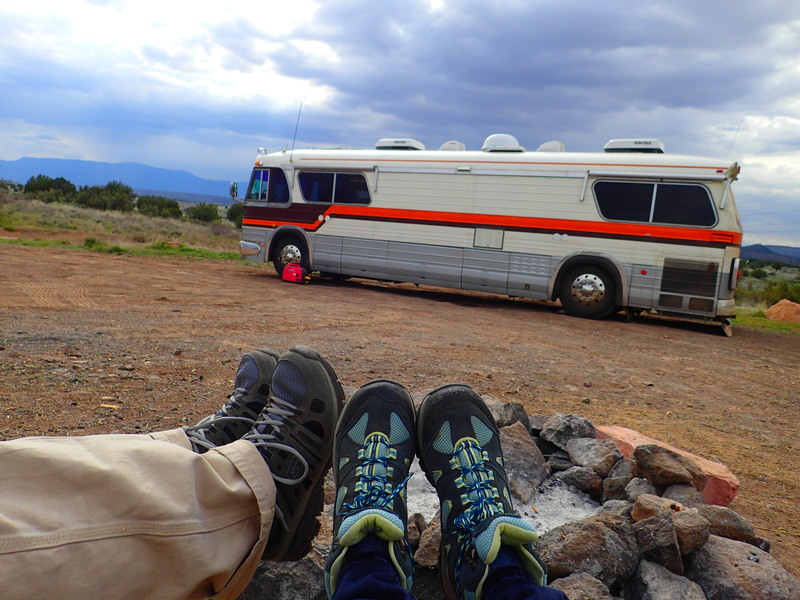 Using these definitions, this was our first actual boondocking stay. We had dry camped and overnighted numerous times, but this was our first instance of just setting up camp out in the middle of nowhere. It was fantastic, free, and liberating. 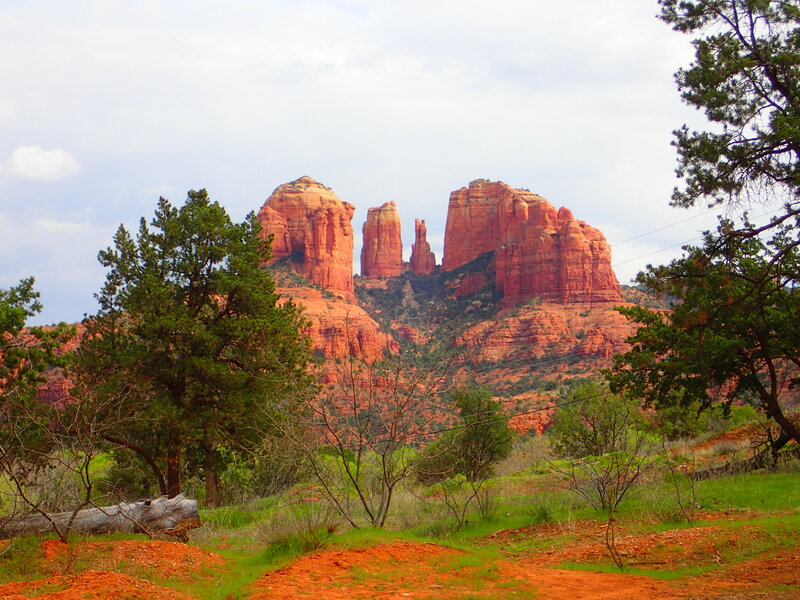 We would not be having a typical Sedona visit: no jeep tours or aura readings, just a couple of days in the outdoors alone. To be sure, we had some challenges: When we had our potable water system repaired last week they apparently removed a spring operated check valve. The system works perfectly if you are hooked up to a pressurized water hose, but if you are relying on your own freshwater tank and pump, it just shoots the water out of that now unused water hook up point and won’t maintain system pressure sufficient to supply the faucets. I will either have to install a check valve, an isolation valve, or perhaps just a screw in plug for the hose connection point. For this trip we were down to using a one gallon jug carried in from outside for all our needs. After two nights we headed out towards the Grand Canyon, where we had luckily managed to get a three night reservation at the full hook up campground despite doing so with less than a month of notice. 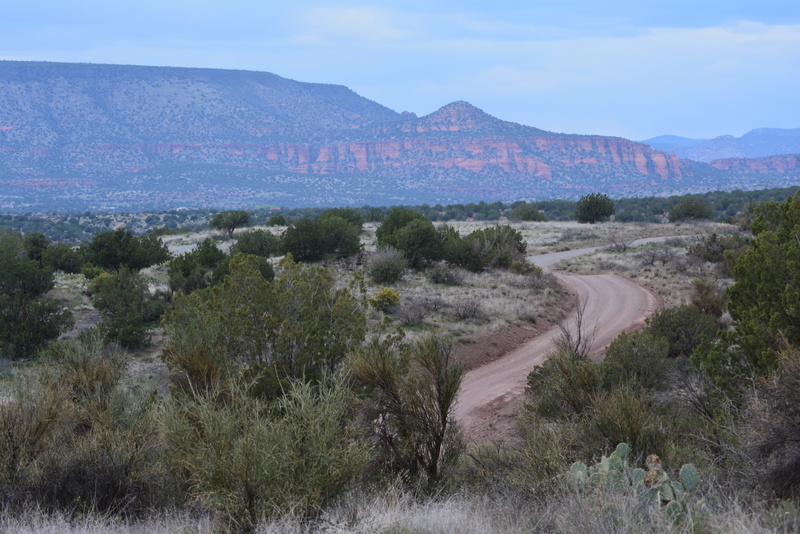 Rather than take the never-to-be-driven-again 89A back north, we elected to drive into Sedona and turn south on 179 to intersect I-17 after a short drive through one of the most scenic areas of the region, and then take I-17 North towards Flagstaff and the Grand Canyon road. Panoramic with Church of the Holy Cross a bit left of center and low. Built here perhaps to remind the hippie spiritualists of the One True God or something. 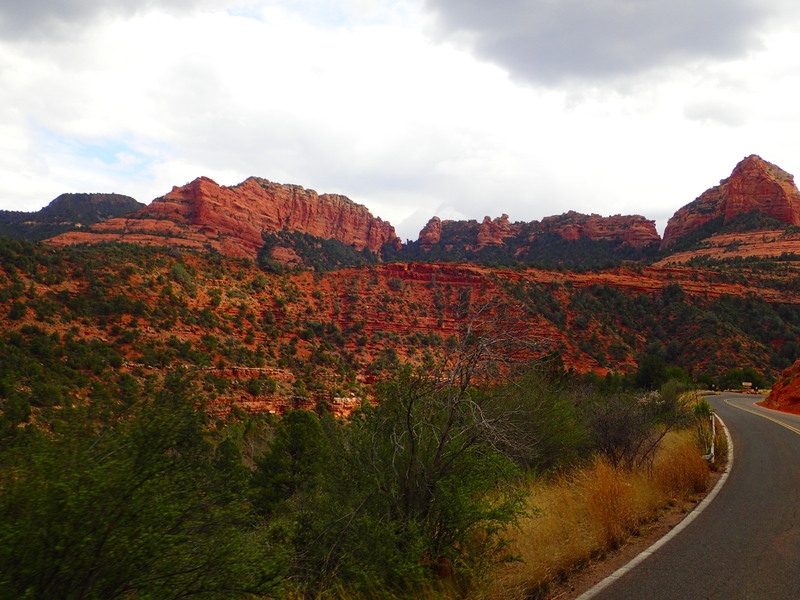 This allowed us to get some of those breathtaking views of Sedona without the white knuckled driving experience, and probably took us no longer to run since The Big Kahuna would almost certainly have been in first gear for the entire 89A uphill climb. Additionally, we passed an art fair in Oak Village just a few miles south of Sedona, and they had designated bus and RV parking. I should have known that we could not escape Sedona without spending some money. I purchased a nice high quality hat and a wedding band while Rosie got a hand crafted necklace made from mesquite thorns. and this is my ring. Don’t be jelly. The rest of the trip was relatively uneventful: yes we spent a lot of time struggling up some of the 6% and 7% grades on I-17 in first gear, but the down hill sections were nice and wide with no hairpin turns so I could let Kahuna have his head without needing to pump the brakes more than occasionally.